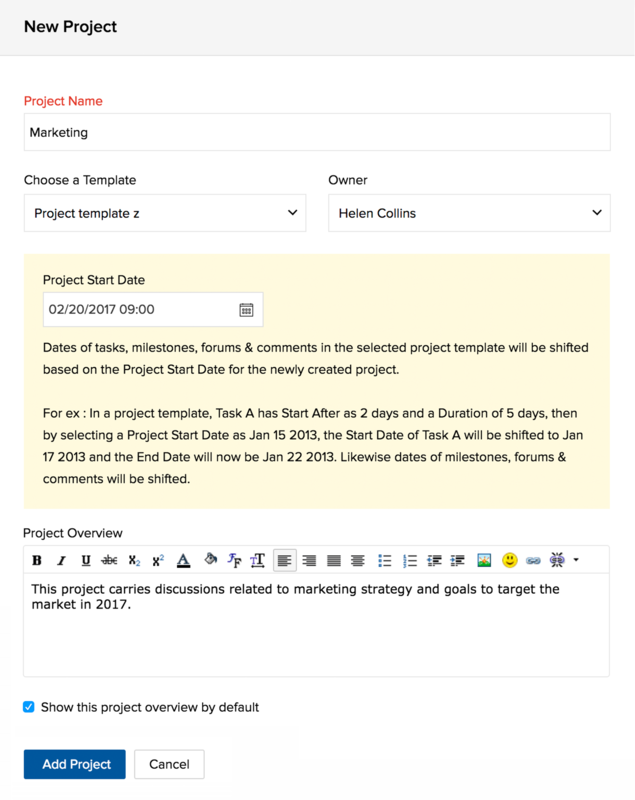 Project templates can help you manage your work more efficiently. You don't have to repeatedly enter the same tasks, and can thus save time and be more productive. Project Templates can be accessed from the project list view or from the setup page. Navigate to Projects and select Project Templates from the drop-down. You can also navigate to > Portal Configuration > Templates > Projects and access project templates. Click here to learn more on access privileges for Project Templates. Create project templates and use them in your upcoming projects. They save a lot of your time. Navigate to Projects and select the drop-down where you can find the list of categories. Click Project Templates and you can see the list of all the project templates. Enter the Project Template Name and select the project that you want to make as a template in Choose from Projects dropdown. Check the Add closed tasks as open tasks in the project template option if required. Closed tasks in the selected projects will be added as open tasks in the template. Click Add Project Template to create your new project template. Hover over the project template that you want to edit or delete. Click and choose Edit Template or Trash Template to edit or delete the project template. Hover over the project template that you want to clone. Click and choose Clone Template to clone the project template. It is possible to edit project templates and make changes to the project modules like Tasks, Task lists, and Milestones to match your business needs. 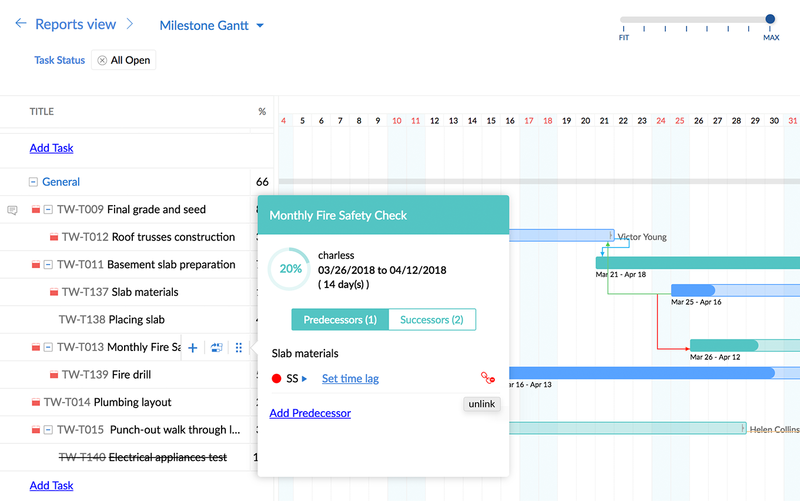 While adding tasks in project templates, you can choose to start the tasks after few days, weeks, months or even hours after the scheduled project Start date. Only if you have set your Task Duration in hours in your Module Configuration, the hrs option would be displayed in the task's Start After field. Navigate to Projects and click New Project in the upper-right corner. 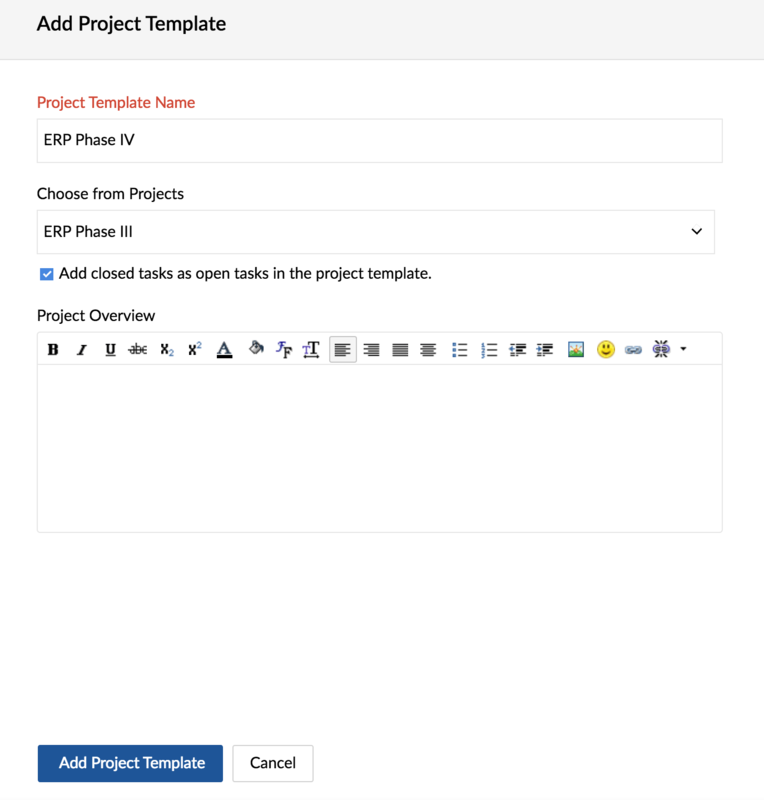 Select the existing project template in the Choose a Template field. Enter the Project Start Date of your project and fill in other details. Click Add Project to proceed. You can create tasks and set recurrence and reminders for them. These will apply when you create a project using the template. In a project template, you can create tasks and set them to recur anytime using the Recurring functionality in Zoho Projects. You can set recurrence details while creating or editing a task. 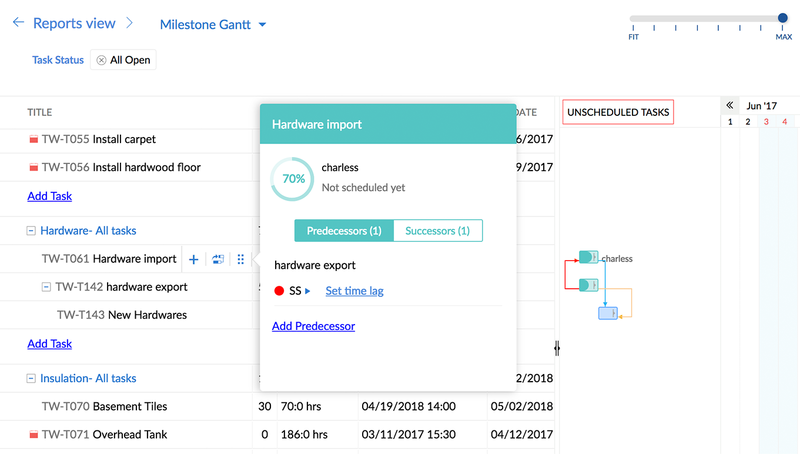 You can enable the Set to previous business day option, to automatically set the previous day as the Start Date for the task, if the Start Date of the recurring task occurs on a holiday or a weekend. This option is enabled only if the Recurring frequency of the task is set to Monthly or Yearly. You can also set the recurring frequency for tasks without any defined limit. The No End Date option helps in defining the limitless occurrence. If you're working on multiple tasks, you need a reminder to know the start and end dates of the tasks. Setting up a reminder will send timely email notifications. With task reminders in Zoho Projects, you don't miss a single task. None: There are no reminder mails for these tasks. Daily: Reminder mail for a task is triggered daily from the scheduled date in Start Date until the Due on date. (Mail notification is sent every day, from the selected start date until its due date.) Also, based on Business Hours settings, reminder mails are sent even if the task Start Date and End Date falls on a weekend or holiday. On Same Day: Reminder mail for task is triggered only on the scheduled Due on date. (Mail notification is sent only on the task due date.) Also, based on Business Hours settings, reminder mails are sent even if the task Due on date falls on a weekend or holiday. day(s): You can set reminder mails to be triggered any desired number of days, ahead of the scheduled Due on date. For example, you can set reminder mails to be triggered 3 days before the Due on date. Also, based on Business Hours settings, if you have skipped weekends in your settings, reminder mails are calculated and sent skipping the weekend or holiday. However, you cannot set reminders for elapsed date in Zoho Projects. Setting dependency between tasks is the best way to track their progress. You will be able to set dependency between tasks of the same project in Project Templates. Know more about task dependency. Navigate to > Portal Configuration > Templates > Projects and select a project template. 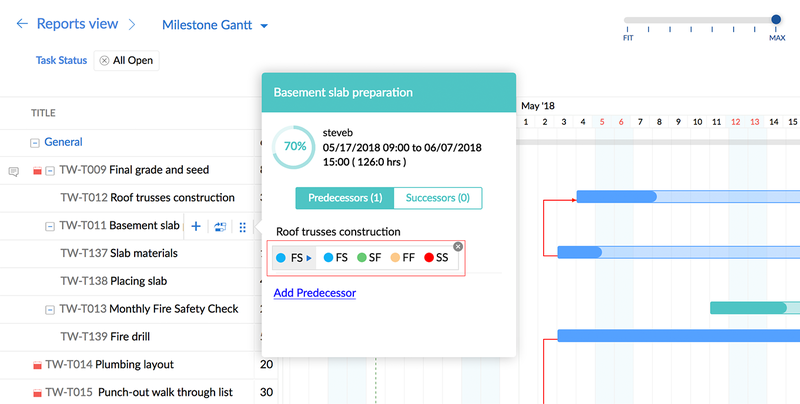 Select Gantt Chart from the left panel. Mouse over a task to open a popup. Enter the task name you want to link into the Select Tasks field. 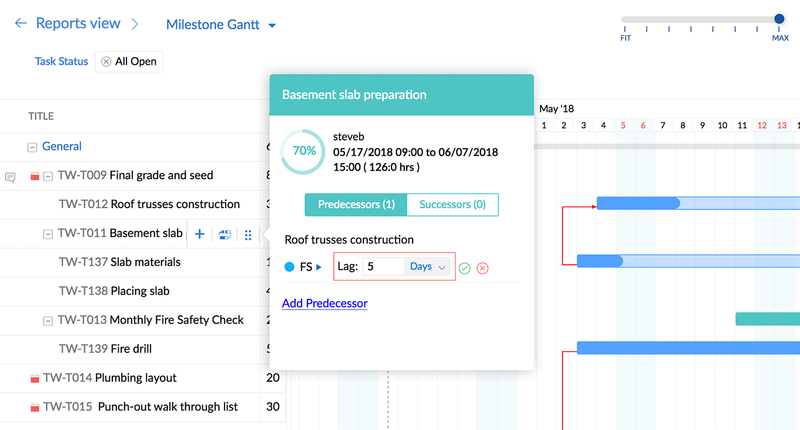 Select Gantt Chart from the left panel. 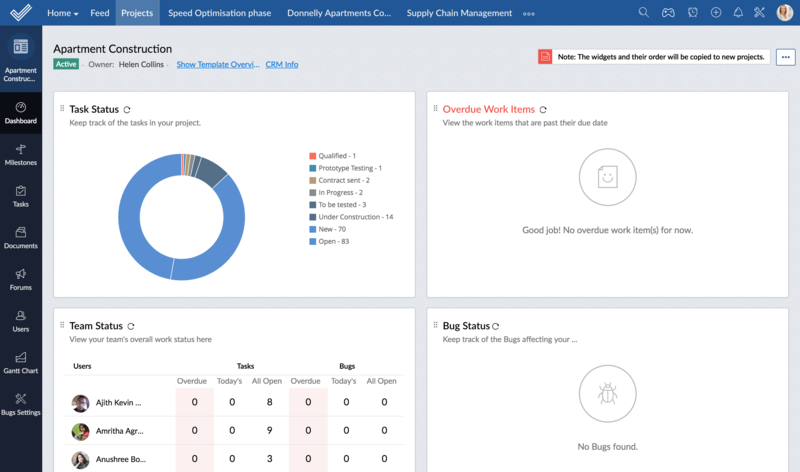 The tasks of all open projects are available in a list view. Mouse over the task to view a pop-up. Toggle between the Successor or Predecessor tabs to view the linked tasks. Click near the current dependency type to modify the dependency. Know more about types of dependency. Mouse over the task for which time lag or lead needs to be set. A pop-up will appear.